Tackle tough cutting jobs with the newest addition to the iON tool series, the Sun Joe iON16CS cordless chainsaw. Powered by the interchangeable 40V EcoSharp Li-Ion battery system, the iON16CS delivers up to 40 minutes of whisper-quiet run time with zero carbon emissions for cleaner air. This cordless dynamo is also engineered with a powerful 600W brushless motor for increased battery efficiency, optimal motor performance and extended motor life. The iON chainsaw starts instantly with a simple push of a button. Featuring a self-lubricating 16-inch Oregon cutting bar and chain, the iON chainsaw can easily saw through the most stubborn tree limbs, up to 14.6-inch thick. It is virtually maintenance free. Safety features include a hand guard with kickback brake, a protective sheath for safe blade storage, and a built-in safety switch to prevent accidental starting. The Sun Joe iON16CS 40V 16-inch cordless chainsaw makes it easy to get equipped for a variety of outdoor cutting chores. iON 16-inch 40V Cordless Chainsaw Tackle tough cutting jobs with the newest addition to the iON tool series, the Sun Joe iON16CS cordless chainsaw. Powered by the interchangeable 40V EcoSharp Li-Ion battery system, the iON16CS delivers up to 40 minutes of whisper-quiet run time with zero carbon emissions for cleaner air. This cordless dynamo is also engineered with a powerful 600W brushless motor for increased battery efficiency, optimal motor performance and extended motor life. 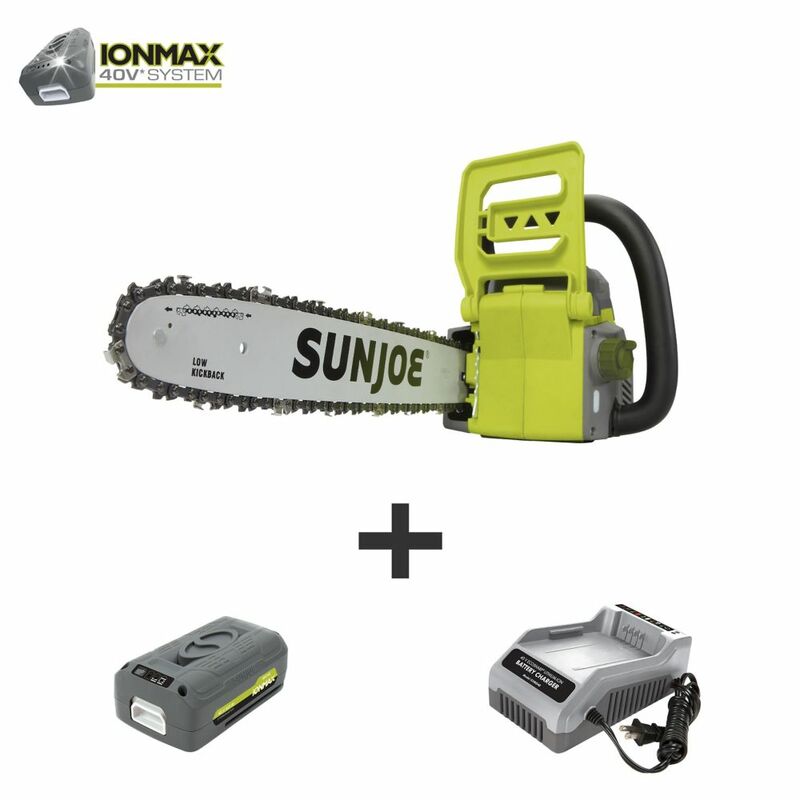 The iON chainsaw starts instantly with a simple push of a button. Featuring a self-lubricating 16-inch Oregon cutting bar and chain, the iON chainsaw can easily saw through the most stubborn tree limbs, up to 14.6-inch thick. It is virtually maintenance free. Safety features include a hand guard with kickback brake, a protective sheath for safe blade storage, and a built-in safety switch to prevent accidental starting. The Sun Joe iON16CS 40V 16-inch cordless chainsaw makes it easy to get equipped for a variety of outdoor cutting chores. iON 16-inch 40V Cordless Chainsaw is rated 4.6 out of 5 by 38. Rated 5 out of 5 by Easygoing from Exactly as I expected. It is easy to handle and the battery lasts just enough to complete any job... Exactly as I expected. It is easy to handle and the battery lasts just enough to complete any job within my capability. Rated 5 out of 5 by RobinC from Great product My husband bought for me. Easy to use keeps good charge and safe. Highly recommended! Rated 5 out of 5 by Brian959 from Surprisingly Powerful with Great Battery Life I am a middle-aged 6' male and this is my first chainsaw. It is powerful and the battery life (5ah) far exceeds expectations! It made short work of smaller trees and limbs. I had to slow down a bit for the larger trunk (12"-14") and let the saw do the work. It cut through it just fine! I would highly recommend and never consider a gas powered chainsaw, unless you want something to scare kids on Halloween. Rated 5 out of 5 by coach43 from Handy saw! Everything as advertized! Easy to use, quiet and will handle any type of wood. I was skeptical, have always used gas saw, but am very satisfied. Would not hesitate to buy another! Rated 5 out of 5 by NoShoveling from Chainsaw worked Great! Nice to just pull the trigger... Chainsaw worked Great! Nice to just pull the trigger and not have to mix gas and oil and smell the fumes. The saw is so much quieter and easy to use. Rated 5 out of 5 by Butte from 5 minute easy assembly. Pruned 5 medium trees and cut up a 35', 8" diameter dead tree into firepl... 5 minute easy assembly. Pruned 5 medium trees and cut up a 35', 8" diameter dead tree into fireplace logs with no loss of power. I am very impressed with this chainsaw. My only concern is the cheesy 90-day warranty.